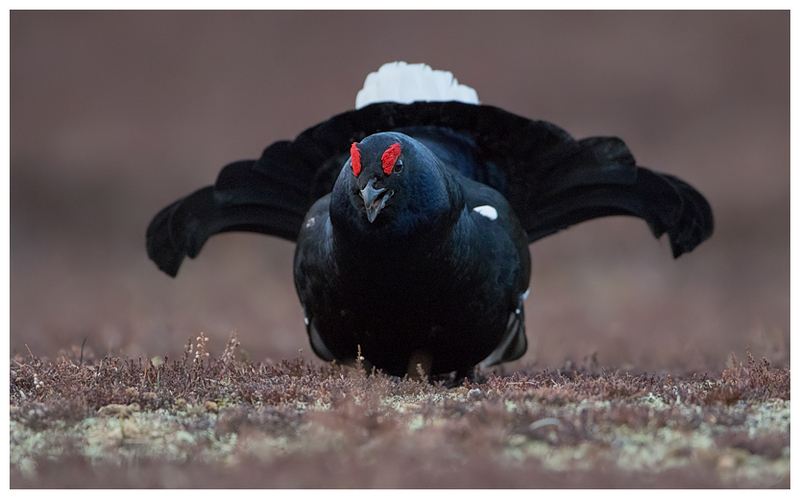 I must be starting to sound like a scratched record now, with my trips north of the border, but after spending a week there recently, I was due to return for just a long weekend, mainly to take in the black grouse lek for real. As the break was limited in terms of time, we (Kate and I) chose to fly up instead of driving and, after a mere 75 minutes, we touched down in Inverness, to be met by Andy at the airport. 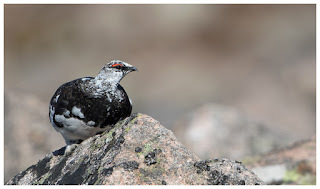 With clear skies and a warm breeze, Andy suggested that we waste no time, and head up to the Cairngorms, and after a quick cuppa, a change of clothes, we were soon parking up near the ski centre, and looking up the hills, or should I say mountains, to where the ptarmigan live. Unlike last time, I could see the paths as most of the snow had gone, with just small pockets remaining in dips or shaded areas of the slopes. And, an added benefit was actually having Andy with us this time, to help guide along the way. Just as well too, as he spotted a pair of ptarmigan near the path well before the usual area, which neither Kate nor I had seen. 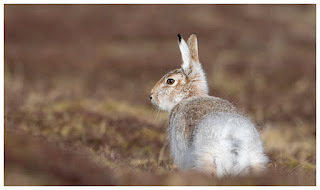 We skirted around the pair, and then slowly approached. Andy was right, the birds' attitude had changed remarkably since even my last visit, and this pair seemed very settled and allowed us to get very close indeed. My last visits had been prior to, and then during the pairing up phases of the season, and the ptarmigan were a lot more unsettled or flighty, flying off at any sudden or unusual movement nearby. Keeping low to the ground, we moved around the birds to get shots at the angles we desired, and often just sat back to watch them as they fed on the fresh shoots of heather starting to appear from between the rocks, or through the snow. 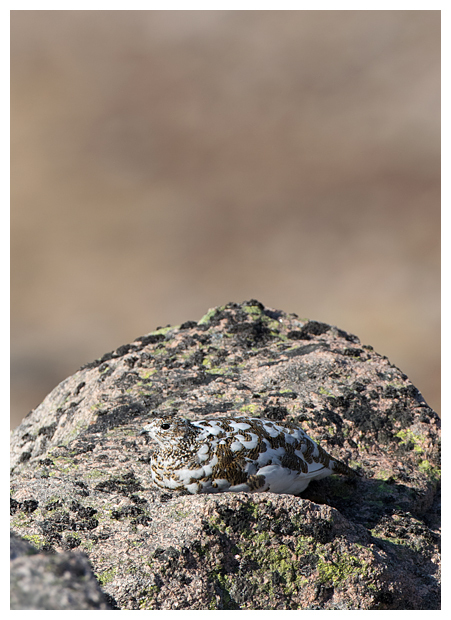 Moving up the slopes, it wasn't long before we saw more ptarmigan and one of the female birds amazed us at how well she blended into the surroundings. 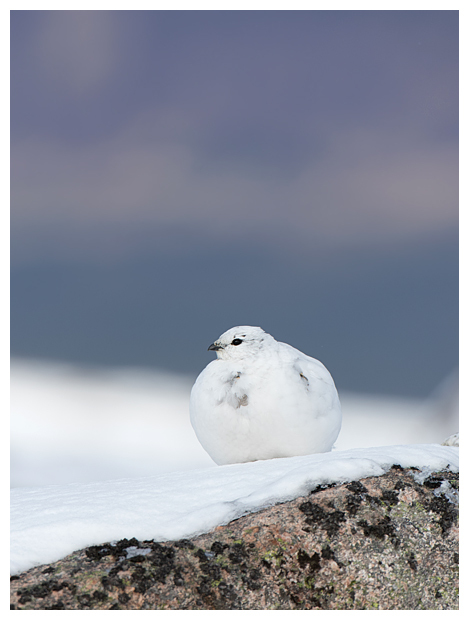 Sat on a boulder, she was almost invisible to the untrained eye, only taking shape when she chose to move. The afternoon flew by as we followed various birds around, and in sheltered spots we were actually too warm having to refill our drinks container with mountain water. 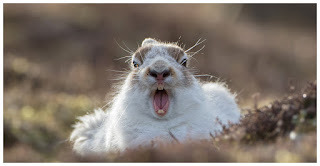 Andy seemed to be getting into the whole sampling nature a bit too much, when he decided he wanted to taste some red grouse poo, commenting that it tasted like a popular shredded breakfast cereal. Maybe he was suffering from altitude sickness?! As the sun sank down, the difference in temperature between being in the sunshine and the shade was stark, and we chased the light down the slopes, only stopping to photograph red grouse, when they were perched in suitable locations. Back to Andy's place, where we enjoyed a meal from Lyndsey and tried to work out timings for the next day's early start... for the lek. We were supposed to be up at 1:30am, but by the time I'd sorted out what I was going to take along, and how I would carry it, it had gone 11, and I failed to sleep at all, choosing to get up at 1am and wait. By 2am we were on the roads to the lek site, and were treated to a fabulous display of the Aurora, though we couldn't stop alas, to photograph it. By the time we'd hiked to the hides, the lights in the skies had all but faded, so we just settled into position, set the cameras up, and began to wait. It was pretty calm but chilly with clear skies. 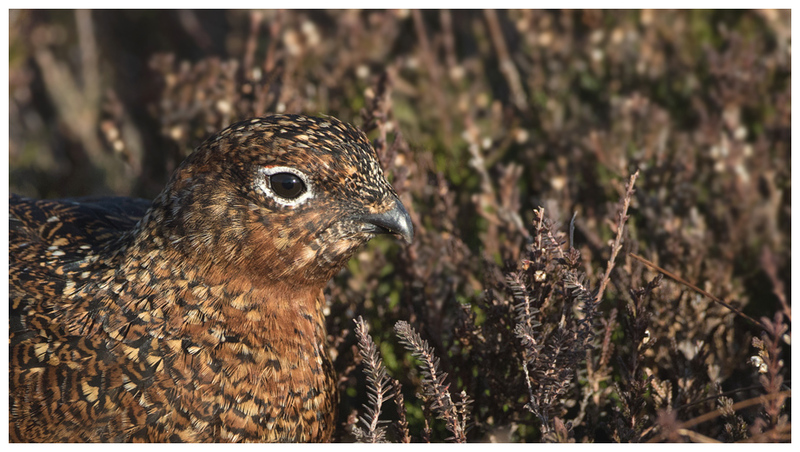 As before, it was a case of waiting for the birds to arrive, then listening to the sounds of the moors, with snipe drumming, before the light crawled across the lek site, and turned the sounds of the grouse into strutting and posturing birds. After the previous visit, I chose to rig up my old 7D on the 500mm, and have the Mk2 on my 100-400mm lens, resting on a bean bag. 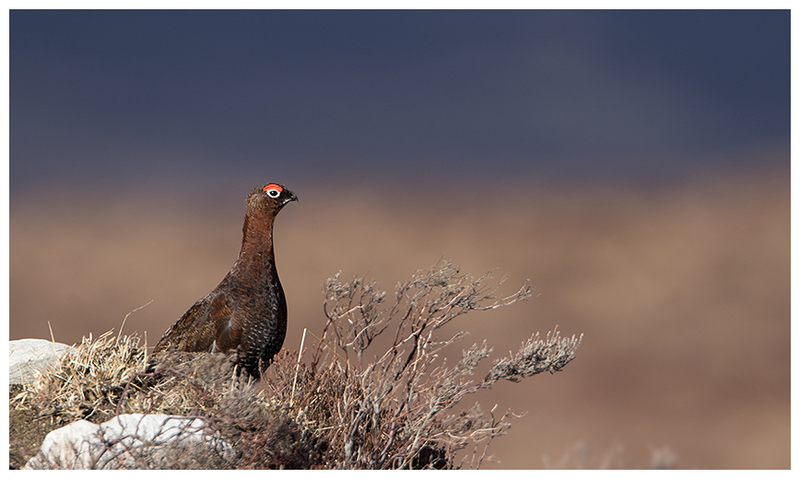 This I hoped would allow me to compose shots better, to take in not only more than one of the grouse in a shot, but also capture some of the breathtaking views behind. 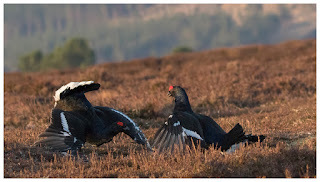 With its ability to handle low light, at a high ISO setting, I was taking pics as soon as I could see the grouse, and unlike the previous visit, the grouse seemed far more aggressive to one another, with them taking turns to face each other up, threaten, pose and occasionally launch an attack. Predicting this is tricky, as sometimes the birds would almost touch beaks, then back away, and walk around one another, before, without any warning signs, dive into an attack, which would be over almost before it began. I guess with Andy's previous experience of a number of leks he was more familiar with this, and I often missed the action, but heard his 1DX machine-gunning away. I managed some shots though, as the lek progressed, and as it did, and the light improved, I kept a watchful eye on the light readings, adjusting the ISO down, whenever possible. Mark Hamblin who manages the site, had mentioned some hens visiting the site on the day before, but these failed to show during our session, though one smaller, perhaps younger male did briefly appear, caused a bit of confusion before being chased away by several of the established brawlers on the site. By the time the sun had risen fully and bathed the area in golden light, the action had mostly finished, and the grouse generally preened and pecked at the heather. Some seemed to take a few seconds to snooze, maybe enjoying the warmth of the sun. Then, one by one they fluttered off. This was our cue to exit, and have a look around the site at the feathers left from the fights. It was also Andy's cue to grab my hat, and boot it into the heather, pretending to be taking part in the lek himself, which was amusingly captured on camera by Kate, who was giggling at his daft antics nearby. 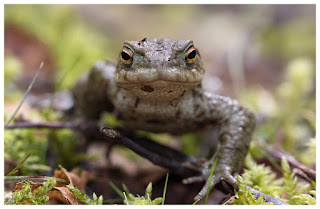 Strolling down the hills, Kate spotted some common lizards sunbathing, and after a short chat with the gamekeepers, we headed back north, to spend the rest of the day at Chanonry Point. Stopping along the way for a coffee and slice of cake, of course! 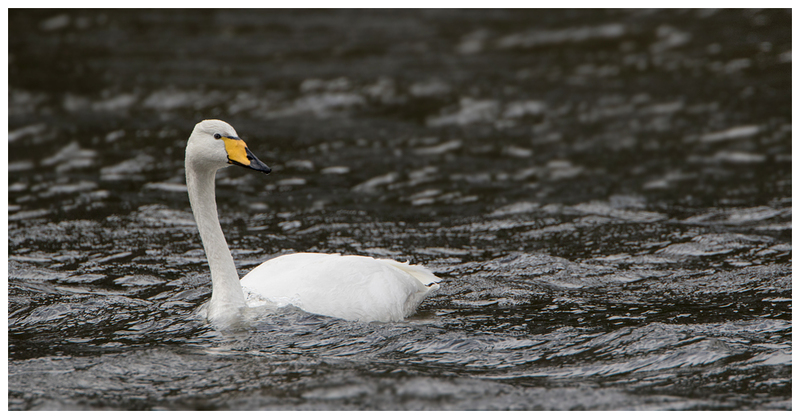 Initially there wasn't much to see at the Point, and this was expected as the salmon run hasn't really started yet. But, it was worth a wait Andy said, as anything can happen there. Besides, we were all too shattered to do much else, other than sit on the shingle and watch the tide come in. Then a disturbance in the water some way out, and a few gulls circling gave away the location of a pair of dolphins. Nothing spectacular in terms of views, with just glimpses of the heads, but mainly dorsal fins and the tail being visible, though pretty close in as the tide reached turning point. 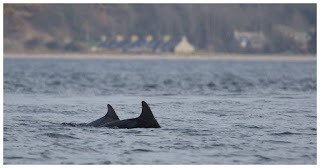 Another dolphin briefly joined them, before they all headed further out, and we opted to head back home. I didn't need much encouragement to sleep that evening, awakening to the plan of a later start, but a return to RSPB Troup Head on the Aberdeenshire coast. Lyndsey was free today too, so the four of us set off east, calling into an ice cream parlour along the way. All of us though, had been fooled by the bright conditions, and chosen to wear lighter clothes, only to reach the cliffs and discover that the gusts of wind were icy cold! It was bright though, and the windy weather meant the gannets would be up at eye-level for the visit. I've been to Bempton Cliffs a few times, but the number of gannets here was astonishing. It was like being in a snow-globe, with them circling round in waves with the gusts of wind. 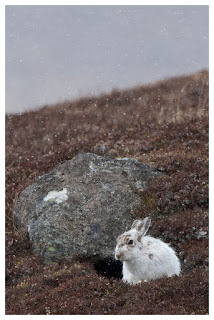 Quite literally at times too, when the hailstorms rolled in from the sea, and battered us as we crouched on the grassy slopes. 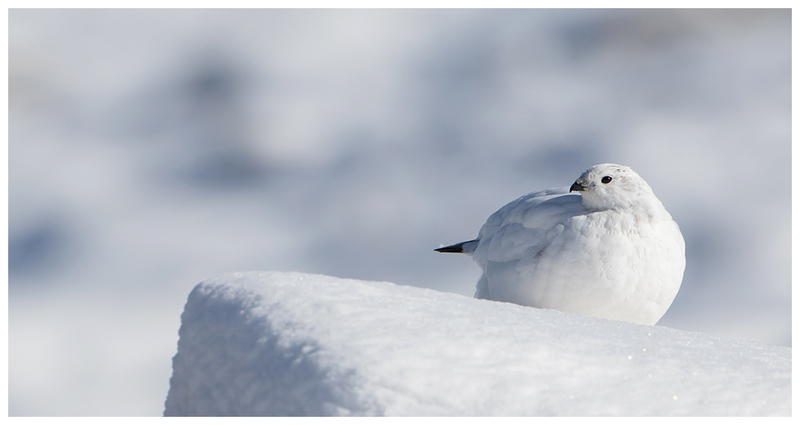 These birds are made of hardy stuff, we all thought. 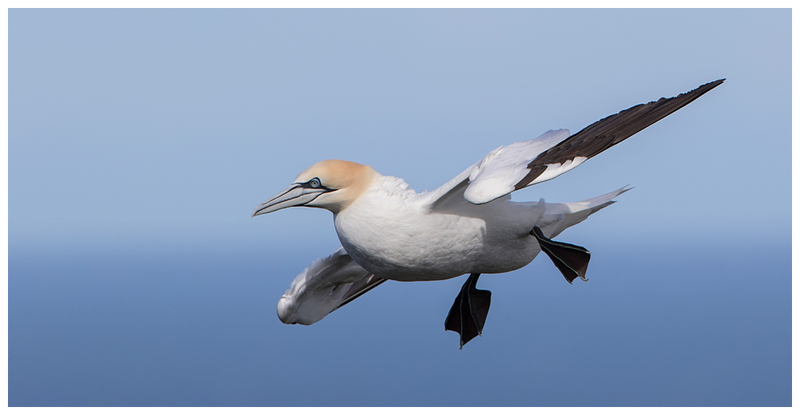 Perched near the edge of the cliffs, we were treated to exceptionally close views as the gannets masterfully glided by on the breeze, occasionally looking across at us as they went. 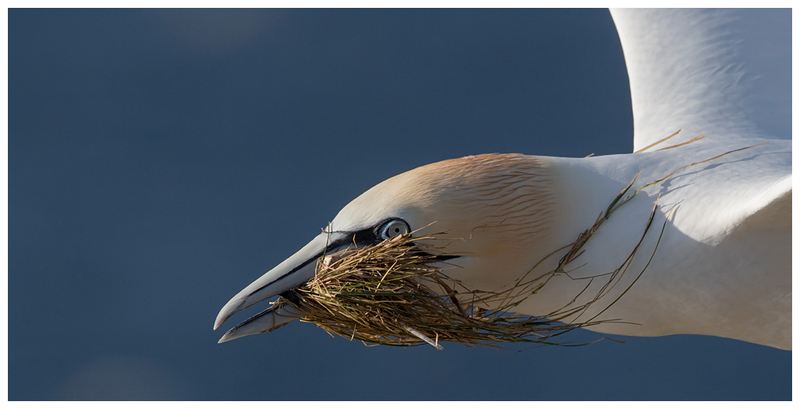 The long grass covering the cliffs was popular as nesting material, and we saw a couple of gannets land, to tear clumps of it away, before lifting off effortlessly again, to return to their piece of real estate on a cliff ledge somewhere. I took the opportunity to try a few of the multi-point focus modes out on the new camera, and found that the group modes are very good at picking up flying birds, even against the rocks and sea as backdrops. Not perfect, but probably locked on 9 times out of 10. And with my UniqBall tripod head, I was able to get shots most of the time with the horizon level, something that was a rare treat with my old head, had luck been on my side with setting things up. 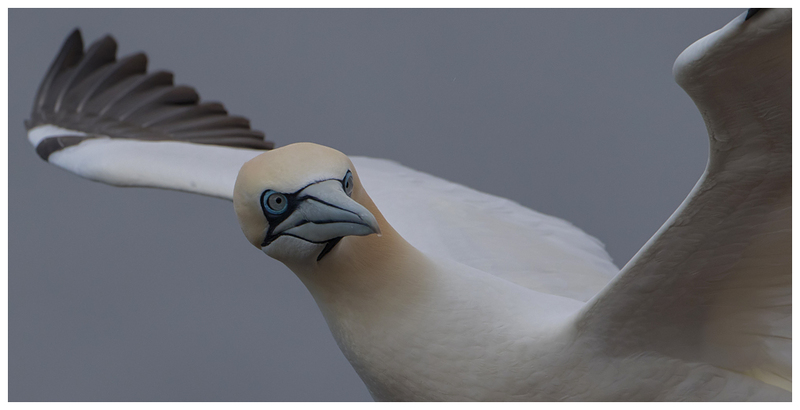 I love gannets, but I also wanted to try for some shots of fulmars, as I often seem to forget to photograph them. 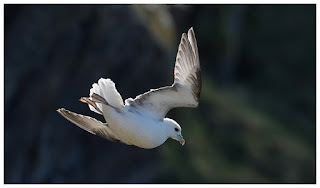 Walking along the cliffs, I found a cove where a few pairs were nesting, and watched as they flew to and from the cliffs. Unlike the gannets that soar around, and brake last minute to thump on to the rocks, the fulmars bob around on the gusts of wind, like a cork on choppy seas, with their legs dangling below, seemingly without control. 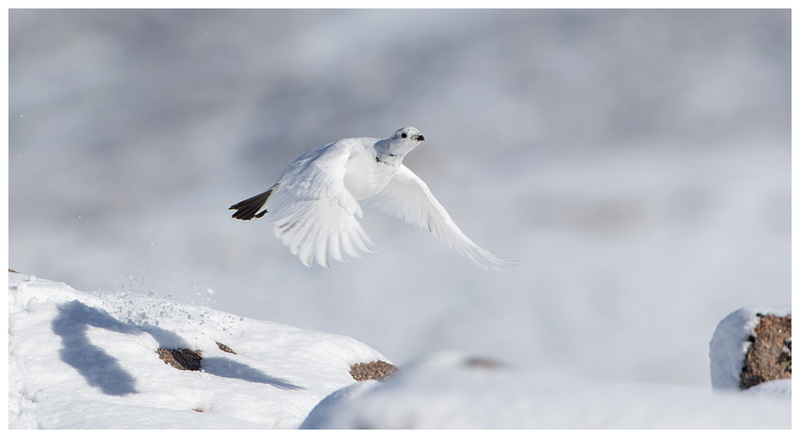 But they were so skillful with their flights, timing the updrafts perfectly to simply step on to their nest sites. 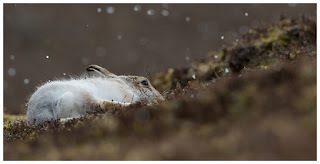 We had all planned and hoped for a good sunset, but as usual with weather and wildlife, it didn't quite work out. 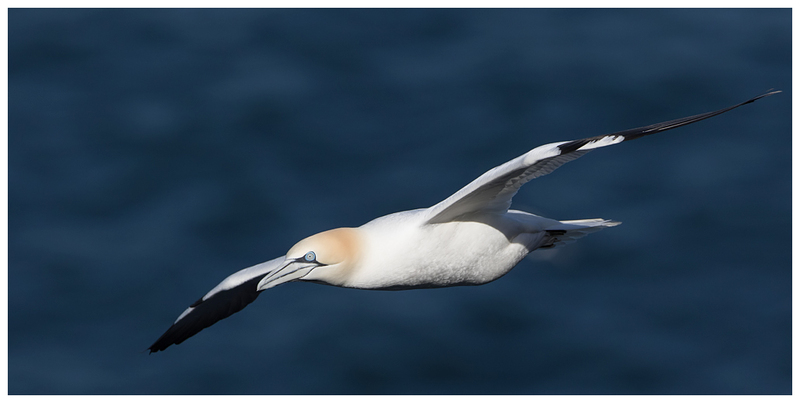 The sun was obscured by clouds just as it was reaching the horizon and the only gannet we had to photo, decided to head off fishing anyway. Fish & chips on the way home, and another most welcome night's sleep. 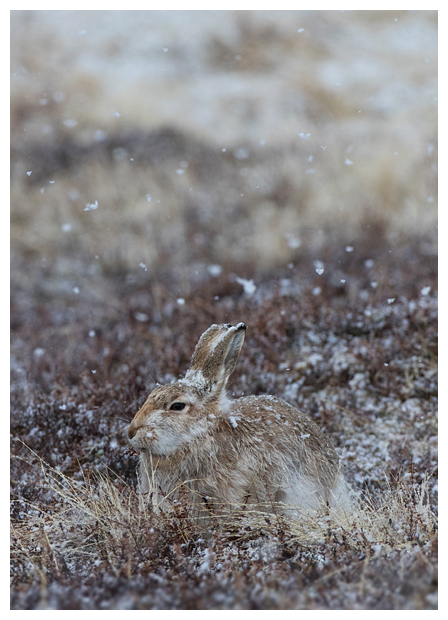 The final day had been planned as one spent on the hills with the hares, but we encountered blizzard conditions along the way, and had to divert to pick up something Kate had dropped at the lek site, from Mark. Then the fuel light pinged on and Andy chose not to risk it, and to be honest, I didn't fancy getting soaked and cold on the final morning, for the flight back. 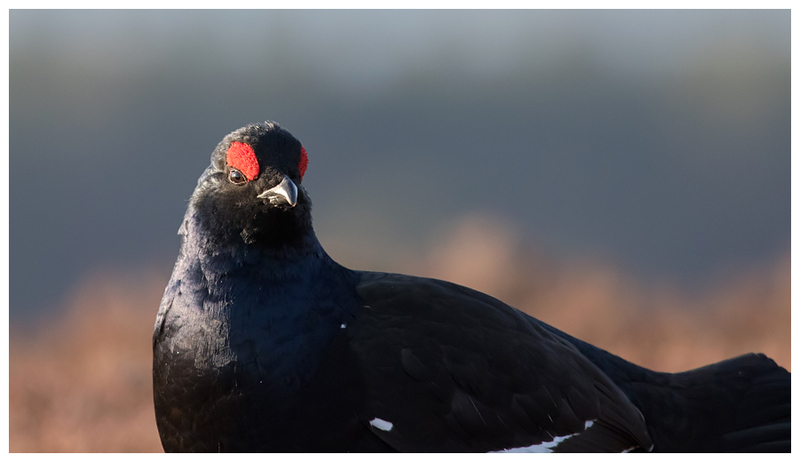 We ended up touring round in the hope of seeing something, taking in Lochindorb eventually to grab some last red grouse shots. Always welcome, even if I have about a thousand of them already! Leaving Mull via the Fishnish terminal felt somewhat alien, and despite knowing I was heading north for more adventures, I still felt slightly saddened to be travelling away from the Isle, especially on a calm, sunny morning. The crossing was brief, and after allowing those in more of a hurry than me past, I continued my journey across the moors, through the glens towards Corran, where I had intended to get a second ferry over to the main road, leading to Fort William. 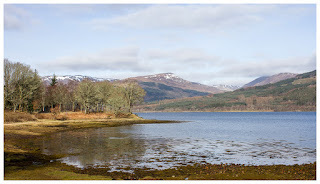 However, it was glorious and there was an alternative, scenic route to be used, which led north along the edge of Loch Linnhe before heading west around Loch Eil. With no schedule to adhere to, I took the longer route, and loved every minute of it. The scenery was at times breathtaking, and I thought it'd be rude of me not to stop occasionally to drink it all in. Before long I was on a "main" road (one with 2 sides!) 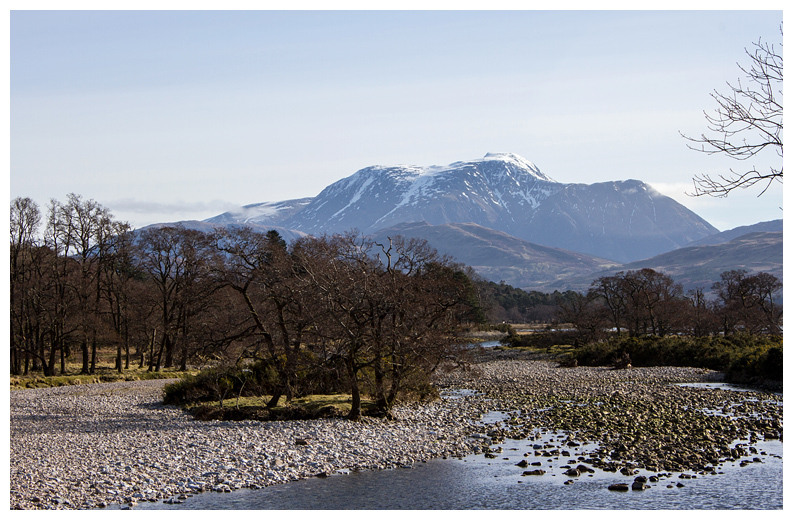 heading north, being rather thankful that the authorities had managed to open the A82 again after a landslide, and providing me with a direct path to Inverness. Disappointingly I failed to spot Nessie as I drove along, but I started to smile when I recognised the roads leading into Inverness, and following his good directions, I was soon trundling up the track to Andy's house. Dumping my bags in the spare room, Andy was quick to explain what wildlife was around and suggested we head out to the mountain hares, seeing as the weather was good and we had plenty of time on our hands. 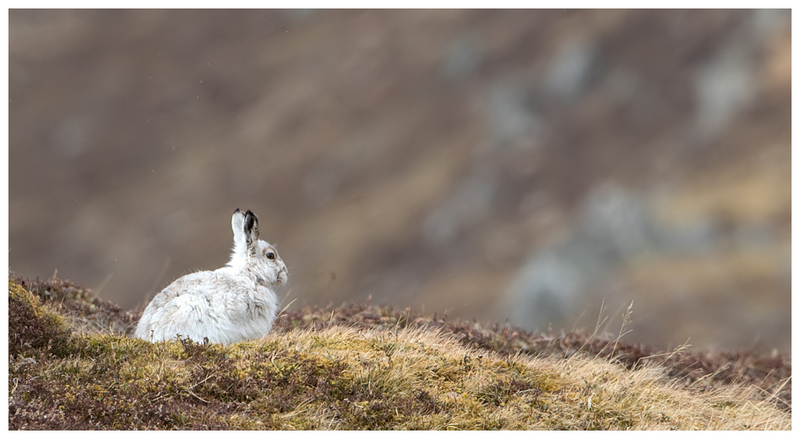 Thankfully, one of the hares that Andy had introduced me to before, nicknamed Bagpuss, was sat contentedly on the hillside, with another whiter companion nearby. With careful approach, we soon got close enough to them for some shots and I followed Andy's lead on what angles to try for, and listening to his knowledgeable ramblings on what to expect the hares to do, based on his lengthy observations of them over the years. 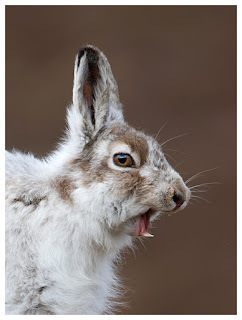 It has to be said, once settled and accepting of your presence, hares don't do an awful lot. You have to be patient, innovative with angles and observant of signs of activity, so as to be ready for them to perhaps stretch or yawn, or groom for a short while. 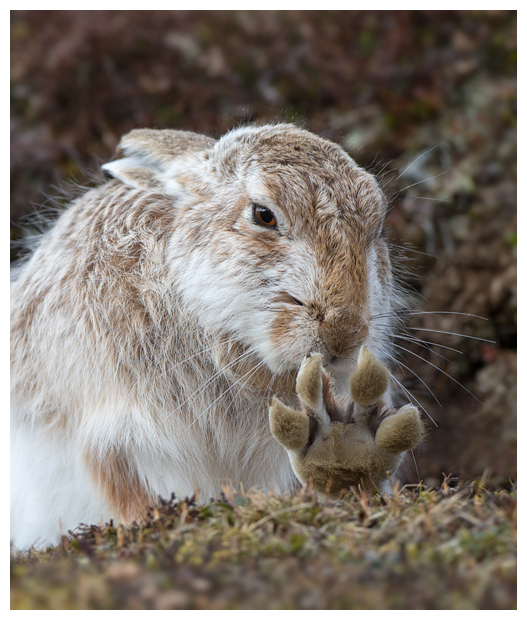 They do occasionally wander off to feed too, but being so close to a wild animal, and for them to go about their business with you present is a real privilege. Heading back after, we diverted to some moorland to look for red grouse, but were surprised to find another hare, somewhat standing out like a sore thumb in the darkened heather. Then it was back for a much needed meal with Andy and his wife Lyndsey, who had both kindly offered to let me use their place as a base for the week. 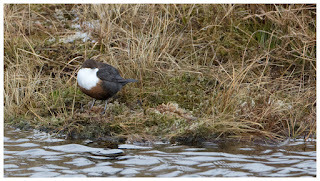 Sunday was a day off for both of them, and we set off to look for some local reserves. 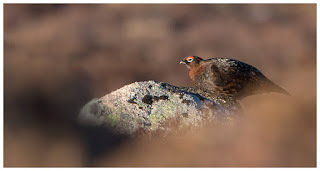 Finding one from the RSPB proved to be interesting, taking in some bumpy tracks along the way, but eventually we found the right place. 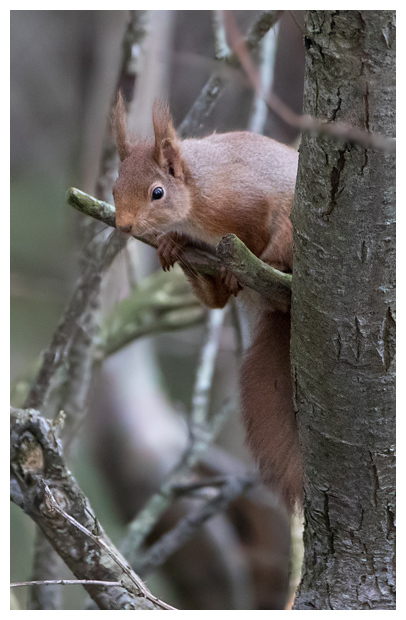 The lake had a hide on it, and aside from the wildfowl on it, there were feeding stations either side, to bring in some woodland species of birds, plus red squirrels. It was a pretty gloomy day, and the local water rails, apparently frequently photographed around the hide, failed to show, though I heard a couple calling some distance away. Two pairs of little grebes provided some entertainment though. And a red squirrel visited, and spent some time actually inside one of the feeders! The cloud failed to lift and we spent the remainder of the day out in the moors, watching the antics of red grouse. 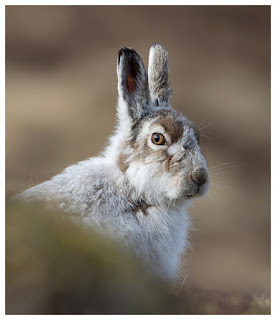 Some of which were sometimes a bit too close to us to focus on! 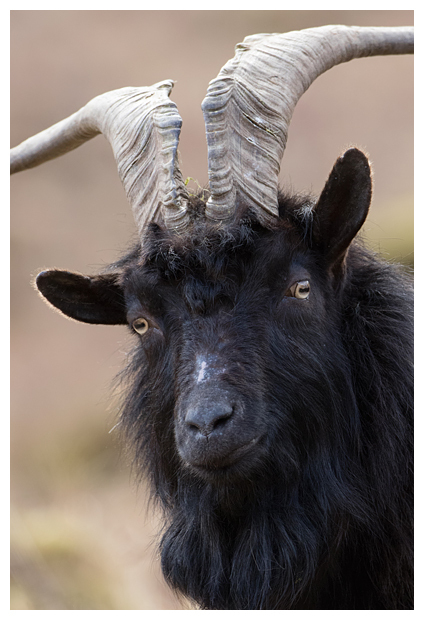 After seeing so many deer on Mull, I had hoped to catch up with some in one of the glens of the Highlands, but my drive proved fruitless, finding cattle where there had been deer before. Just one stag showed, and that was off before I could compose a decent image with it. 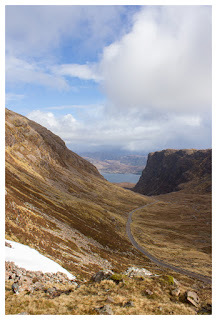 Not wanting to waste the day, I decided to head over to Applecross (I know, it's not exactly close but I knew the scenery would be spectacular along the way), and the clouds out west seemed to be more fragmented. And then a castle (Eilean Donan), though the sun resolutely refused to shine upon it. Before long I could see the mountains and the pass leading to Applecross, and as before, when Andy (and Derek) and I had visited for ptarmigan, the sun was shining upon it. So, would I finally get to see the ptarmies at the top? No. Just as I turned the car up the steepest part of the road leading to the top, the cloud rolled in, and by the time I was at the car park, it was snowing so hard I couldn't see past the end of the bonnet. It cleared eventually, but by then I was unwilling to trek up to the top, for fear of another icy blast rolling in. Sat in the car I watched a distant white-tailed eagle lift up over the summit, and an even more distant golden eagle drift along the ridge behind. 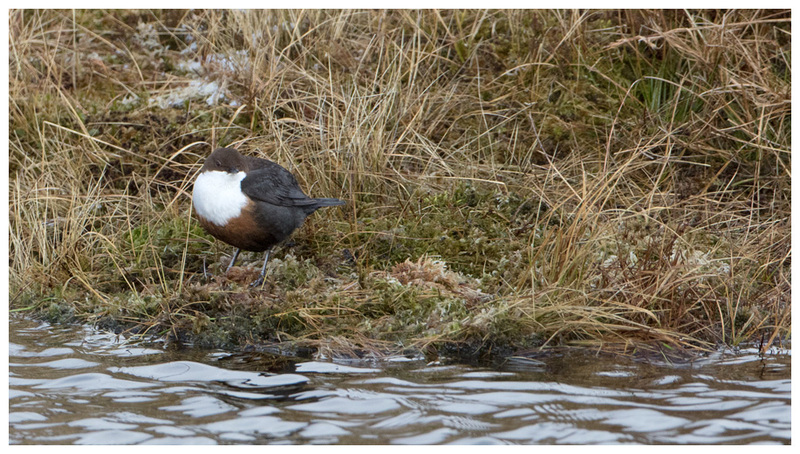 Bizarrely though, on the way back down I noticed a dipper on one of the small pools. Grabbing some shots of the scenery as I left, I thought it would be wise to head back, given the time it had taken to get there. 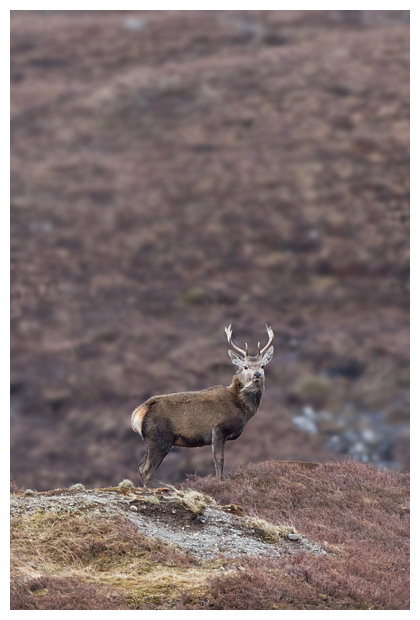 Amusingly, as I enjoyed some of the faster, straighter roads back towards Inverness, I spotted a stag, posing pretty much how I had hoped to see them in the glen where I first headed. I wasn't going to refuse such a shot! If Monday had been a day of many miles and not many pics, Tuesday would prove to be the reverse. 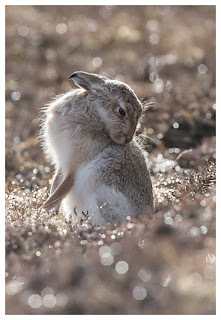 I made my way to where the hares live, and found I had the place to myself for the entire day. With showers forecast, I had wrapped up warm, and soon, using techniques learned from Andy, was sat on the hillside next to Bagpuss and his friend. 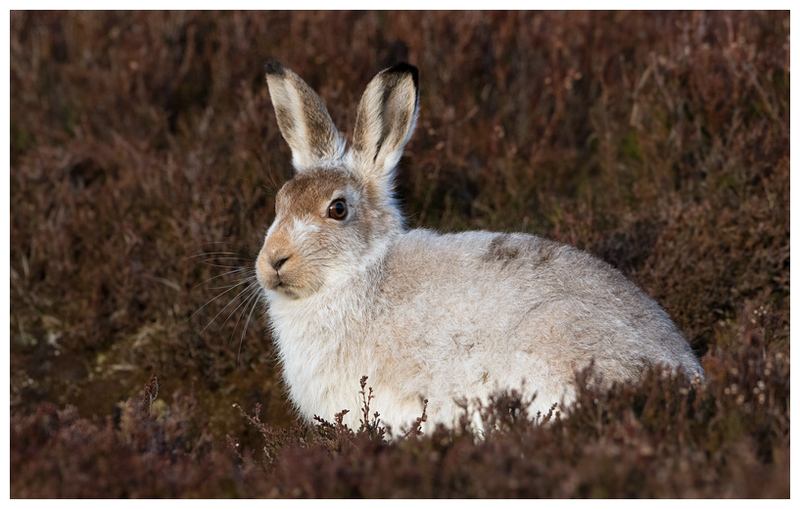 With a bright start to the day, I focused on getting portraits of the hares. 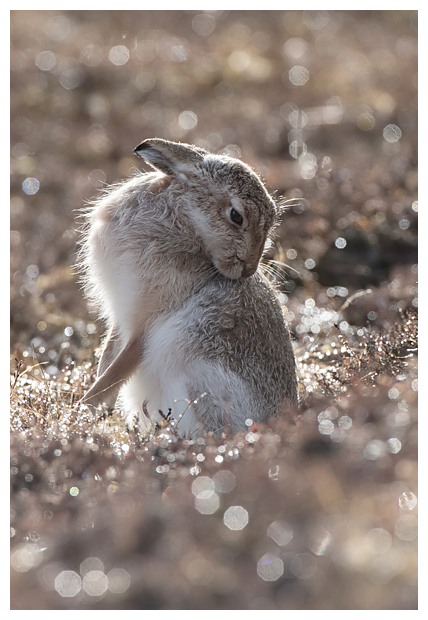 At this time of the year, they are losing their white winter coats, both from grooming and rolling around on the heather. It can be seen from the images, that the browner fur is starting to be revealed. As before, I watched and patiently waited for them to do something. Doing so I was able to grab images of them cleaning and yawning. Then, as I tried for yet another angle, something magical happened. It started to snow. Only briefly, and soon the clouds had moved off down the valley. Trying for some other hares proved more tricky, and as I found out from Andy later, the individuals I attempted to approach are far less tolerant than Bagpuss. One legged it before I could even start moving towards it, while the other waited for me to start climbing a steep slope before it decided to relocate. 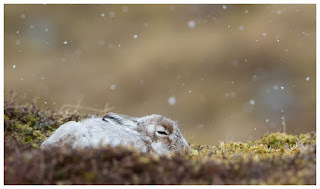 I found a third sat out in the open and as the snow came down again, it initially allowed me to sit close by for some shots, before it scampered around me, to a form nearby, where again it allowed me to approach. By now the snow showers were coming in thick and fast, and the view down the valley vanished at times. 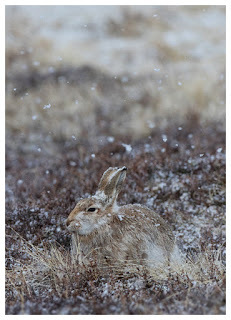 This made for more interesting images of the hares, and I was keen to watch if the weather affected their behaviour. Bagpuss had ventured out to roll in the heather, but the snow seemed to put a stop to this, and he ambled off to feed instead. 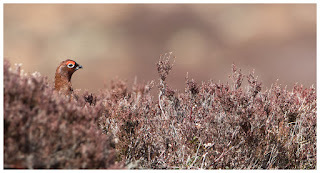 His colours certainly help him blend into the surroundings. 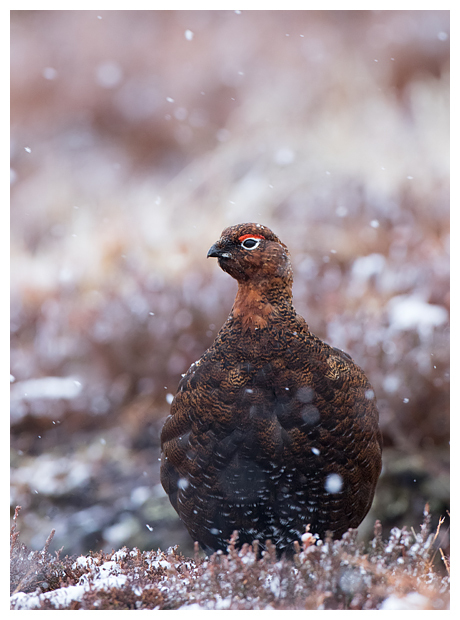 Eventually the cold and wet (mainly because my gloves aren't waterproof) forced me to leave, and I spent the remainder of the day up on the moors with the red grouse, again taking advantage of it being snowing for some different shots. 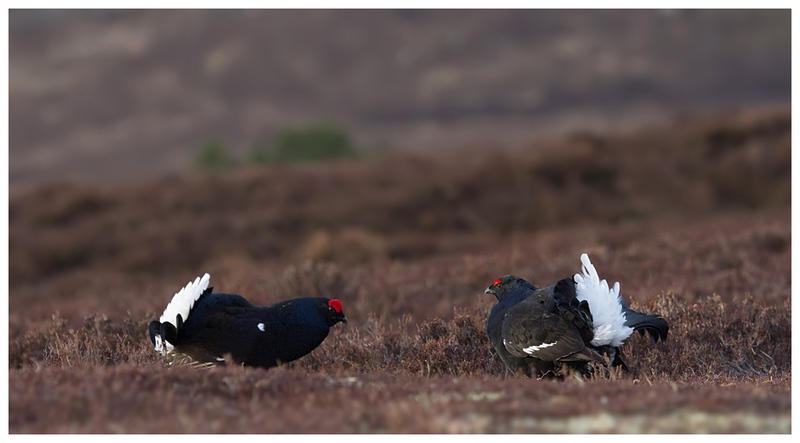 Most are paired up at this time of year, following the females around, and fending off rival males, should they dare stray too close. All week I had been watching the forecasts, and Wednesday seemed best to try for the ptarmigan up on the Cairngorms. With Andy's detailed instructions and a map he'd lent me, I was soon puffing and panting up the slope. Overnight it had continued to snow and some of the paths described to me had simply vanished. 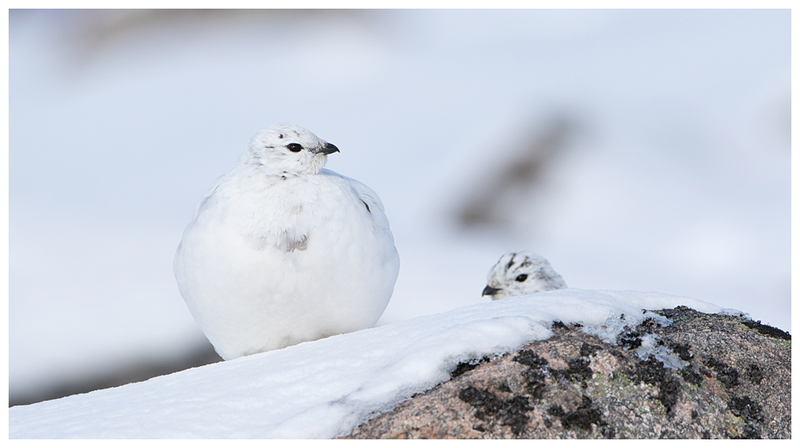 Nevertheless, after a call to Andy, I was soon in the right place and kneeling in the snow with a pair of ptarmigan sat on boulders nearby. With such bright light and snow reflecting it all around, I was able to drop the ISO right down, and whack the shutter speed up. Then it was a case of locating the birds and hoping they'd stay still. Thankfully, I managed to bump into Derek again, and I realised that following him around would be best, with his experience of the area. Climbing one side of the corry we found several individuals, including some still in full winter guise. 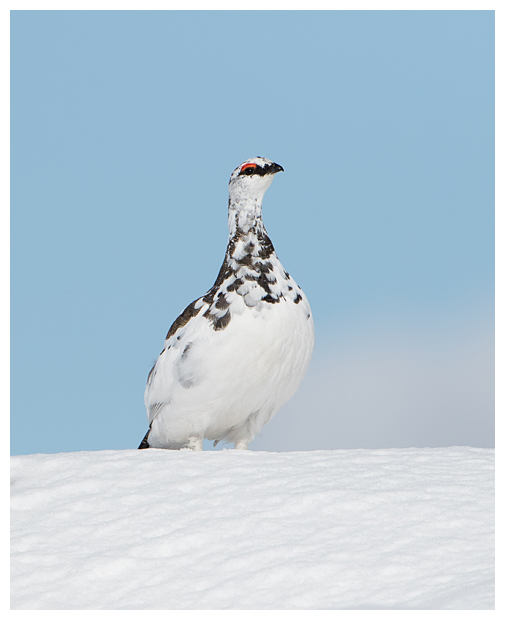 They're stunning birds. And then taking care to cross to the other side, as the ground made up of holes, boulders and streams was completely covered with snow, we caught up with another group. With some taking guard, watching us, others dug away at the snow to uncover the heather to eat. 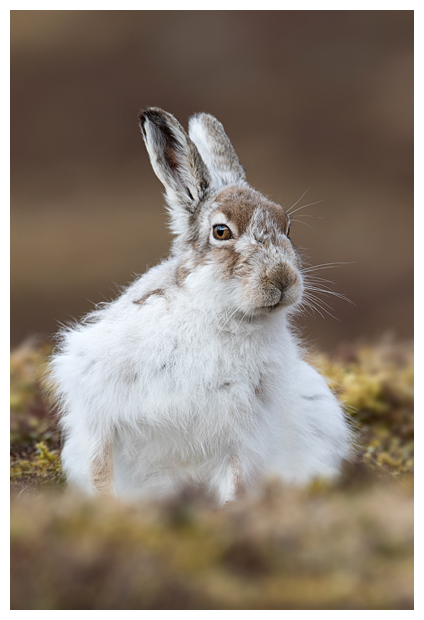 As with the hares, I tried to get some angles to achieve the best backdrop to the images, using rocks, the snow and when possible, the blue sky on display above. The hike up, crawling round on my knees, balancing between boulders, trying not to let my camera fall away from me and holding it all steady for shots proved to be rather tiring, and I left the mountain mid-afternoon. Surprisingly, the way down was much easier as where there had been snowy slopes before, gravel paths now showed me the way back to the car park. Amazing how quickly the snow thaws from the hillsides. 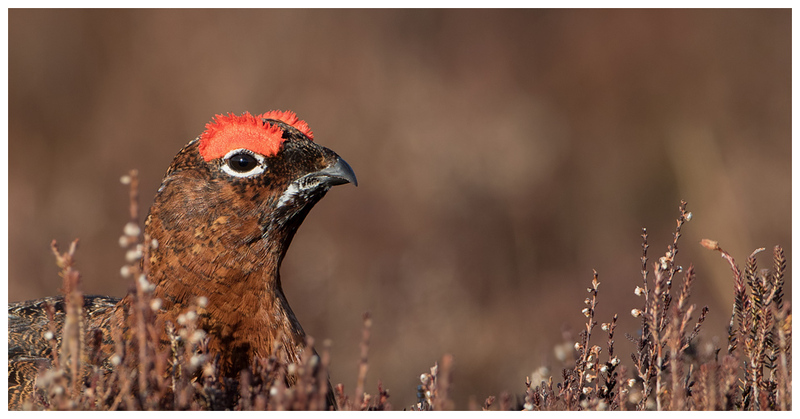 Not wanting to waste the fine weather, I again headed to the moors to catch up with the red grouse, and capture them in bright conditions for a change. 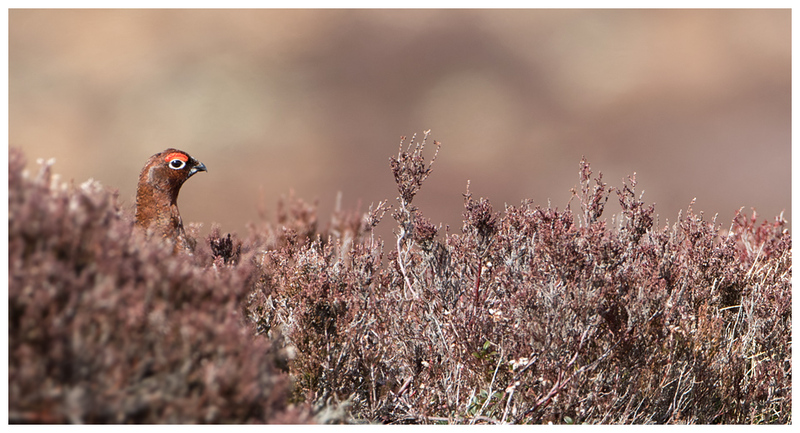 While the males with their vibrant red wattles are easy to spot against the vegetation, the females are so well hidden, that they need to move to be spotted. 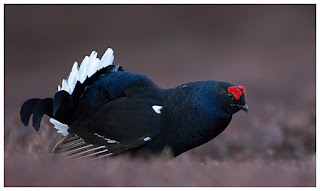 The main event for the week up there though, would be the black grouse lek, and after getting the ptarmigan pics I had wanted, I looked at what was around locally to distract me before then. At the house, with their array of feeders, Andy and Lyndsey have attracted all manner of birds to their garden, and the most vibrant one was worth a look one morning before leaving. Yellowhammers. Up to six at a time and again, with them being rather skittish, I was glad of the silent mode on the new camera. 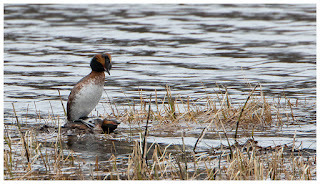 The RSPB site of Loch Ruthven isn't far away, so I tried the hide after Lyndsey suggested it, and she was right, the Slavonian grebes were back... and mating. 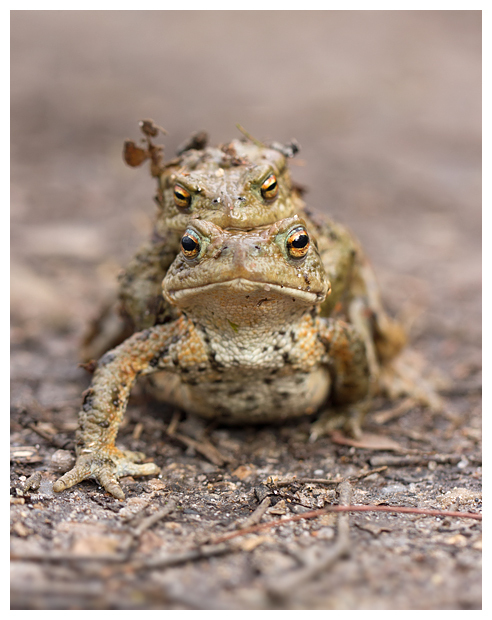 Also around the woods were masses of frogs and toads. The latter often sitting on the paths, something I warned other visitors of, before lying down in the undergrowth with my macro lens, to get some ground-level shots of them. On another loch nearby was a pair of black-throated divers in summer plumage. They're stunning looking birds, but frustratingly remained distant, only heading to the shore of the other side of the loch occasionally. While I could have exercised my right to roam and gained closer images, I chose not to, not wanting to risk disturbing them as they set up their nest. 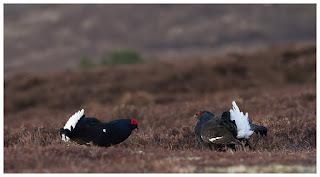 The day of the lek started early. Very early. Begged the question whether it was worth going to bed, when you had to be up for 1:30am. We drove out to Mark Hamblin's place and then followed him over to the lek site. Thankfully some of the hike to the lek was taken care of by my Yeti, which coped admirably with a very bumpy, rutted track through the woods. Soon we were in the hide and after listening to instructions from both Mark and later Andy, I settled down to wait for the action to start. 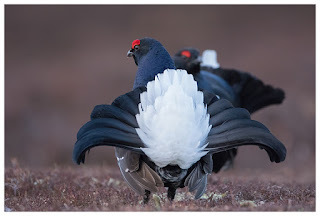 The first sign of it is the sound of the birds landing, and then you have to strain your eyes, to make out the pale tail feathers against the darkness. With dawn comes the sight of the lek, and what a site it is. With mountains behind, it is almost magical. The birds, all males, have been using this site for a while, and do so to size each other up even before the females arrive. Hence, we were witnessing a pre-lek really, not that it was a disappointment. 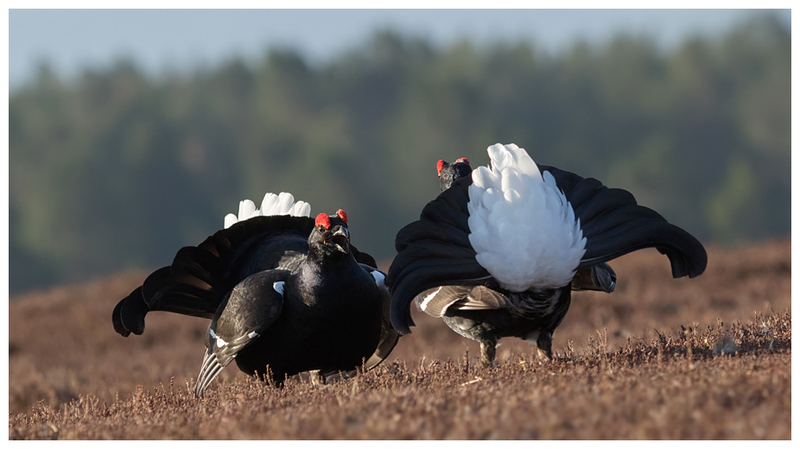 Making gurgling sounds, puffing up their necks, fanning tails and screeching, these males are both fascinating and amusing in equal measures. The hides are slightly below the lek, so images are pretty much at ground level. And thanks to the capabilities of the 7D2, I was able to start taking shots far earlier in the day than I could with the original 7D which was next to me, on a bean bag. That said, I was shooting at ISO 6400 initially! As the light improved, the ISO could be reduced. 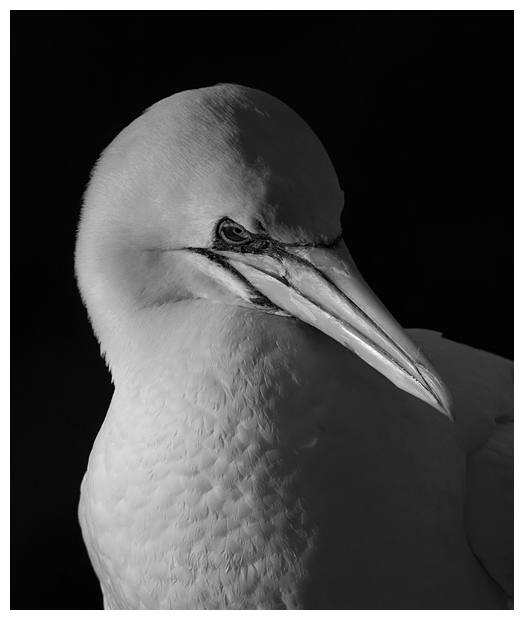 And the challenge was to fit the birds into the frame. 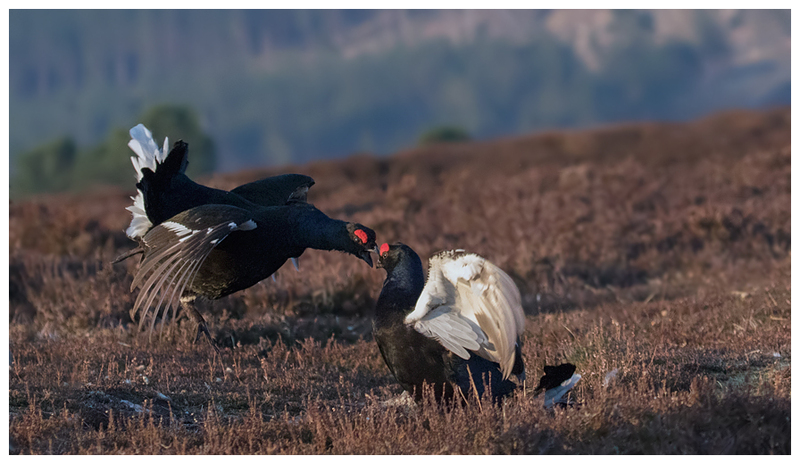 A cropped sensor and 500mm was slightly too cramped for most images where more than one bird was involved. With there being no females present to fight for, this session was mainly about posturing, with a very occasional fracas breaking out. And, as they were over before they seemed to start, I need to watch out for the signs for my next visit, if I am to capture some of the action! Once the light had improved enough for the 7D to work, I could get wider shots of pairs of black grouse sparring. 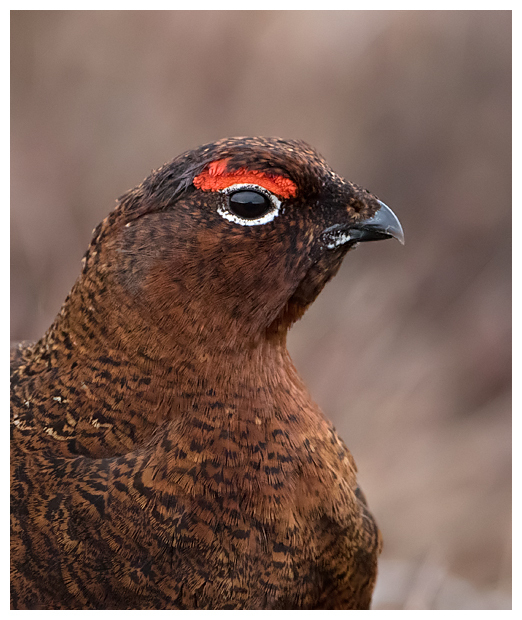 Unfortunately, as the sun surfaced, the birds which had been flighty all morning, departed, and after a wait to see if they'd return, we called time on the session. 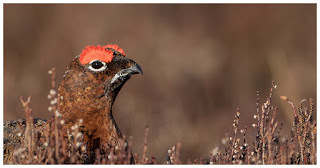 Despite feeling like we had done a day's photography, it wasn't even breakfast time, so we headed north, calling into Huntly for brekkie, before on to Troup Head, an RSPB reserve on the north coast. 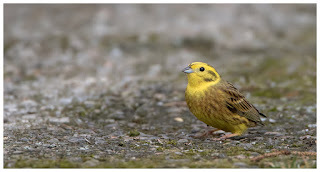 The fields were filled with yellowhammers, though they wouldn't let us get close enough for anything like a decent shot. 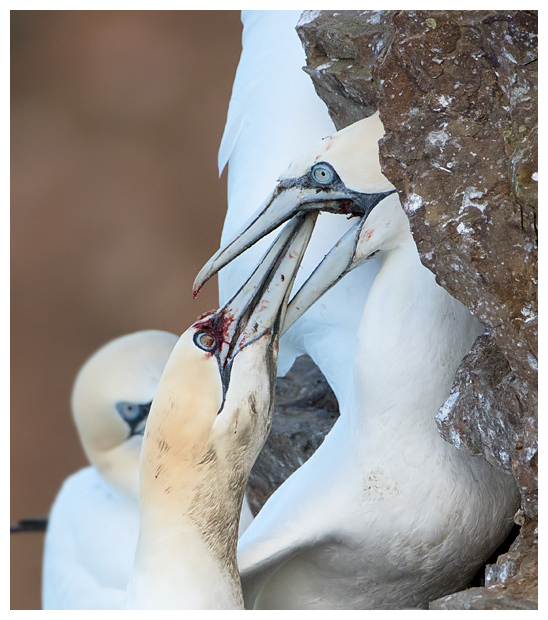 The cliffs though, were already a hive of activity, with gannets, fulmars, kittiwakes and gulls nesting high up, and guillemots and razorbills whizzing around below, closer to the sea. Andy had hoped that a stiff breeze would allow us to get some good flight shots of the gannets, but it eased and we had to make do with shots from their antics on the nesting sites. 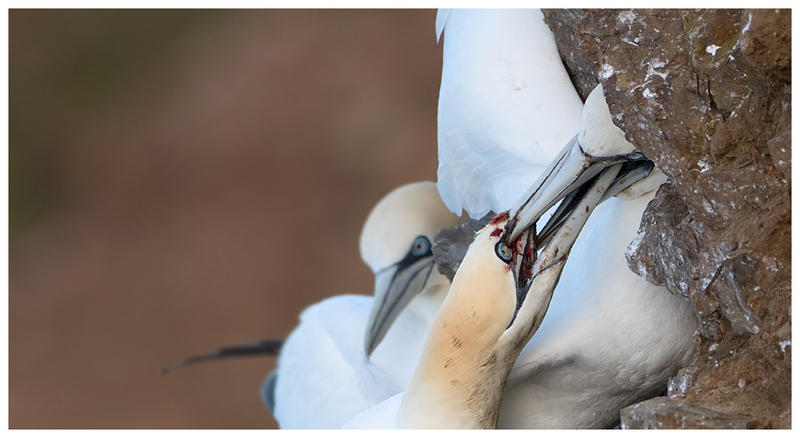 And the calm, serene scene soon turned sour, with a pair of gannets involved in a furious and bloody battle. 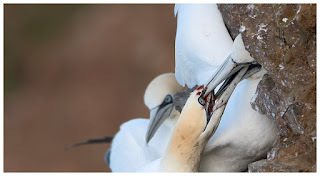 Striking dangerously close to the eyes, they risked blinding each other as they locked beaks. 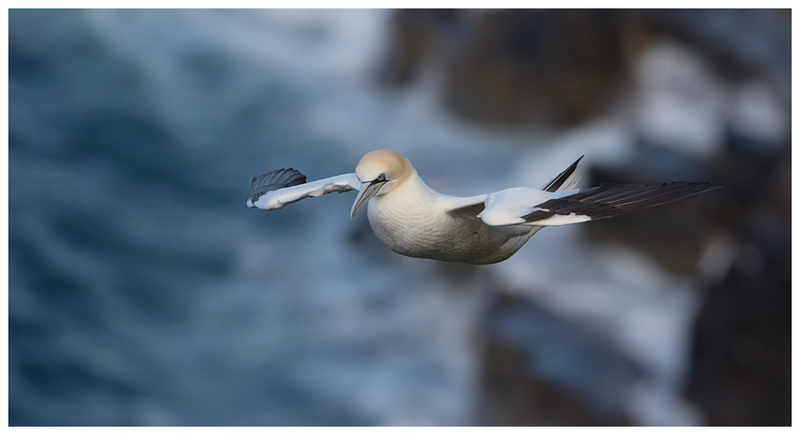 Eventually, they tumbled from the cliff face, plummeting down below and out of sight. We hoped they had the sense to let go before it was too late, but neither returned afterwards, though our tiredness had caught up, and we chose to head home by early afternoon. Calling into a favourite ice cream outlet along the way. 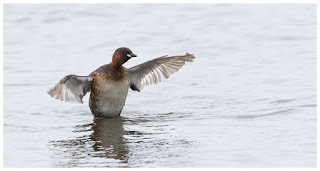 My final day saw me try again for the black-throated divers, and as before, they remained at distant. 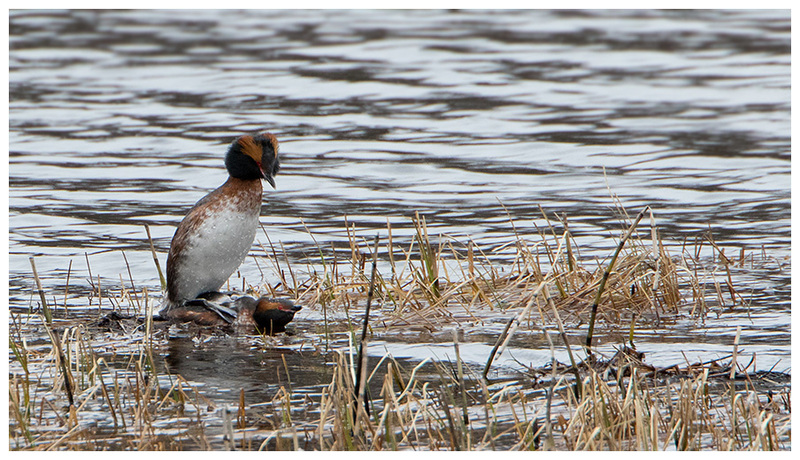 Annoyingly I encountered a pair on another loch, very close by, but they flew before I could get a shot. 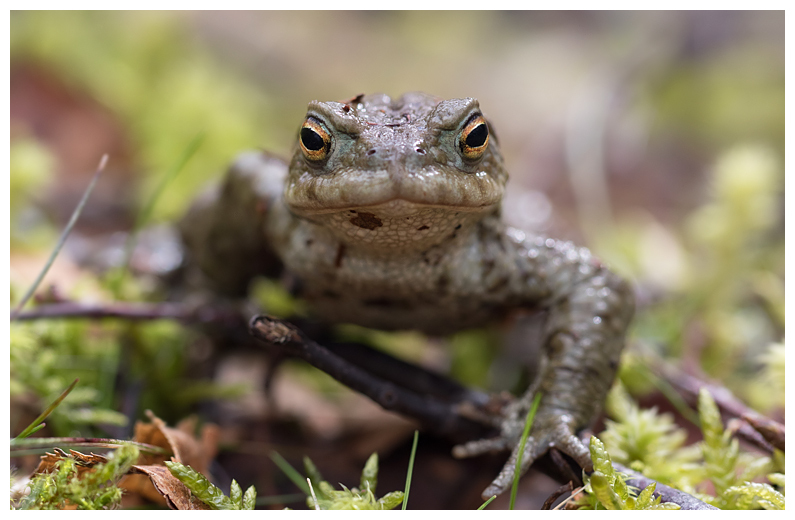 The harsh light and strong winds made for a challenging day's photography, and saw me return to the woodland floor for some more toad shots. And a visit to Boat Of Garten yielded some images of whooper swans feeding on a small loch. 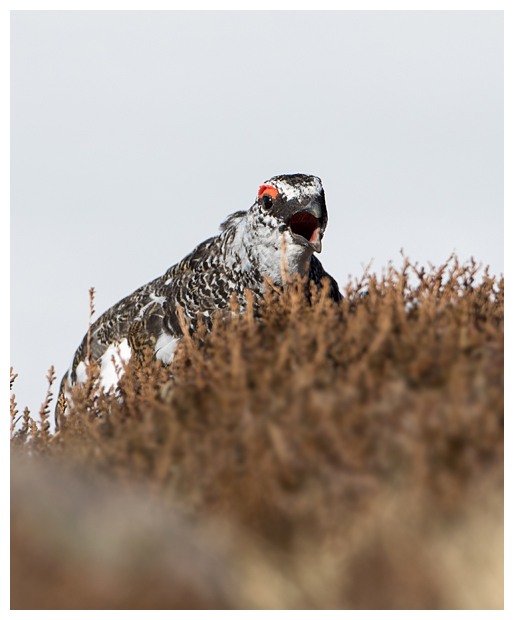 A last look at some moors for some red grouse, and it was time to pack up for the drive home. I set off early morning, having thanked Lyndsey and Andy for their generosity and hospitality during the week. 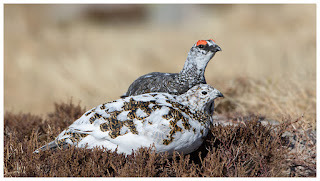 Both have become great friends, and anyone wanting to experience what the Highlands have to offer in terms of wildlife, would do well to make use of Andy (Andy Howard) as a guide. 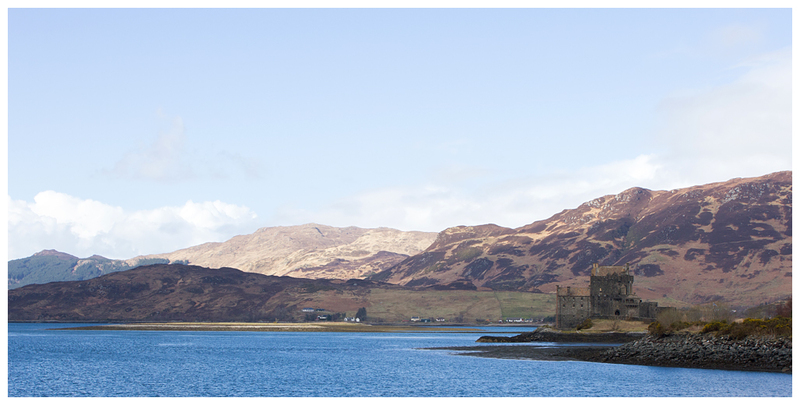 My fortnight in Scotland in March had come to an end, but what a trip it had been. 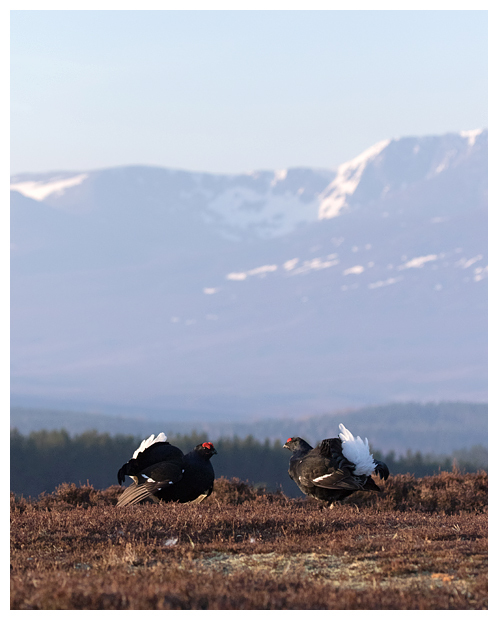 Full of fun, excitement and new experiences, providing memories to treasure, and proving that Scotland is a fabulous destination to aim for at any time of year, for its rich abundance of wildlife.